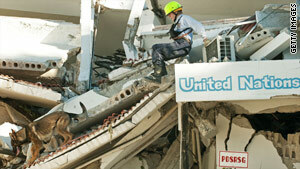 A member of the Fairfax Country Urban Search & Rescue Team and her K-9 partner search the U.N. building Thursday. (CNN) -- The top two civilian officials at the U.N. mission in Haiti were killed in Tuesday's earthquake, Secretary-General Ban Ki-moon confirmed Saturday. Special Representative Hedi Annabi and his deputy, Luiz Carlos da Costa, have died, Ban said in a written statement. Acting U.N. Police Commissioner in Haiti Doug Coates also died, he said. The headquarters of the U.N. mission in Haiti, a peacekeeping and police force established after the 2004 ouster of then-President Jean-Bertrand Aristide, collapsed during the quake. Annabi and da Costa had been believed to be trapped under the rubble. "In every sense of the word, they gave their lives for peace," Ban said.